The Christmas season has arrived! You’ve already got your beautiful Christmas tree up and decorated. Your husband is outside right now hanging up the house lights and setting up the manger scene in your front yard. You’ve got wonderful cinnamon smells pouring out from your kitchen because you decided to get a head start on baking those delicious Christmas cookies. High five! You are totally on top of your Christmas game, sister! Presents! For all the people! Besides your husband’s and kids’ gifts (which you’ve been Amazon shopping for all year long), you totally forgot about your relatives, friends, and co-workers! You start making a list (and checking it twice!). Then, after some quick math, you realize it could cost hundreds of dollars to give every person on your list a gift. Who knew you had so many lovable people around! Gift-giving doesn’t have to break the bank. Start by making a list of all the people that you would like to give a gift for the holiday season. Brainstorm what you think each person might like and write it down next to his or her name. Set a budget. Think about how much you can afford total and then break that down between each person based on what kinds of things you’re thinking about buying. It’s hard not to think about giving every single person on your list their own, individual gift. But the best way to knock out your list quicker and cheaper, is by giving a gift to the group! Think about which people on your list could share a gift. Finding something that everyone would love or could do together will make gift-giving that much easier. Try these unique gift baskets that will be perfect to give a group of your loved ones! Never Underestimate a Good Gift Basket! Movie Night Gift Basket: This is the perfect gift for couples to cozy up for a date-night-in or a fun family gift that all ages can enjoy! Coffee Gift Basket: Make this fantastic basket a group coworker gift and leave it out in the office break room. Everyone will love a few holiday snacks and a good brew! The Connoisseur Basket: Wine and dine your friends with this beautiful and tasty basket by adding your favorite bottle of red or white wine. This gift is sure to please! Family Basket: Game nights can be some of the best memories! Give each family a gift they can enjoy together! Gifting your loved ones with an experience is priceless! It’s the perfect gift that doesn’t require you to hit the mall with the Christmas crowds. It gives your loved ones fun memories for years to come (and something that’s easy to pack in a suitcase)! Get creative and think about places or things to do in their area that would make a fun (but inexpensive) Christmas gift! Zoo Pass: This is a great option for families! Often an annual zoo pass is much cheaper than even just 2 visits and may include parking. Waterpark: Pick up a waterpark day pass to give to young families who could enjoy a fun summer day out! Restaurants: Food always wins! Restaurant gift cards are always a great gift. Find unique restaurants nearby your loved ones that may provide a fun dining experience! Museums: This is a great experience for couples, families, or co-workers! Better Naps: Do you know someone who has a child that doesn’t nap very well and it’s causing a lot of extra sleep headaches? $20 gets both parents in on the Napping Know-How Webinar, a class taught by Certified Gentle Sleep Coach Heather Taylor. Soothing Tips: Do you have a friend or family member who is either expecting a baby or has a difficult-to-soothe newborn? There are several soothing tricks Veteran parents and sleep coaching professionals use that can make a big difference. Spend $20 to send them to The Secret Arts of Baby Soothing webinar. Gifting experiences is the gift that keeps on giving. Bring a smile to your friends or relatives by giving them something they will always remember. It’s an easy way to earn some seriously awesome friend-cred. I know that might sound hard for you during the Christmas season because you have so much to do, but slowing down to enjoy the wonders of this season with someone special may be just what you need too. Free Babysiting: Every couple needs a date night! Offer to babysit for free. Bring a copy of the best Christmas movie ever, pop some popcorn and have fun with the kiddos! Mother’s Helper: Offer to help a young mother watch her kids while she runs errands or takes a nap. Visit: Spend time visiting with an elderly relative or dear friend. Lunch or Dinner: Invite a girlfriend out for shopping and treat her to a holiday lunch. Have you ever thought about using your talents and skills for gifts? There are all kinds of ways you can give the gift of your talents. Photography: Offer to give a family a complimentary photo session. Organizing: Offer your skills to help a friend organize a room in her house or closets. Sewing: Make homemade festive Christmas ornaments that you can hand out to coworkers. Hand lettering: Use your talent for fun holiday signs or cards. Button Wreath Craft: This simple and easy craft can be the perfect gift for anyone’s Christmas tree! Paint Pens: Use these craft pens to write a special holiday greeting or message on these porcelain plates or these mugs to give out as Christmas gifts! Fleece Quilt No-Sew: Make this homemade blanket without the sewing machine but with just as much love! White Kitchen Aprons: Give these to a family or friend using these awesome fabric markers to personalize each apron. Gifting with your talents and skills will make your loved one’s Christmas extra special and your budget extra happy. Who doesn’t love food?! Baking or cooking (even something simple) is a perfect way to give inexpensive Christmas gifts anyone will enjoy! You can even get the kids involved by letting them bake with you! Maybe you bake a simple homemade bread or use your amazing Instant Pot to make a cheesecake to share with friends. Of course, one of the most fun food gifts this time of year is all those yummy Christmas treats or Holiday pies! Wax paper: A simple but classic way to wrap. Add a sprig of pine for color! Butcher paper: Have the kids get out the markers and decorate the paper for an extra special Christmas message! Ribbon and Twine: For a fancy twist, wrap your goodies with a seasonal ribbon! Christmas Tissue Paper: Use festive paper for a perfect gift of treats! Homemade food will always be special and received well! It’s the perfect way to wrap up your list of gifts. 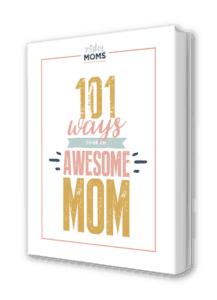 The giving of gifts is one of the best parts about the holiday season, and, what’s even better, now it can be easy because you are a clever mom on a budget. Your friends, relatives and co-workers will absolutely love these inexpensive Christmas gifts because they are so creative and thoughtful, and you will love gift-giving because your wallet is still intact come January!